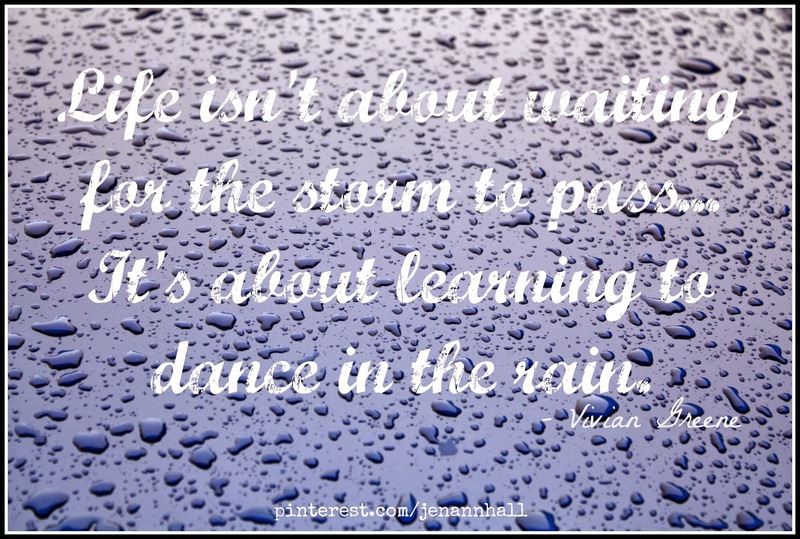 Dancing in the Rain: Guess the Name of the Blog! Guess the Name of the Blog! It's called "Guess the name of the blog"! Sounds like a ton of fun, doesn't it? Do you remember in last week's post about my impending blog name change that I got my inspiration from one of my favorite quotes? I got the inspiration for my blog's new name from one of my favorite quotes. That's it! That's the quote that inspired my blog name change. Ms. Vivian Greene's words seem to be pretty well liked around the Internet, as there are many images with variations floating around. And now I've added mine! This quote speaks to me on a few levels. Simply, that I live in the rainy region of Western Washington. Not so simply, as a big life lesson, especially where the struggles I have are concerned. It says to me, live NOW, don't wait. Maybe you're in the midst of a storm, but you can make your way through it, not only in one piece, but happily dancing, even. So! I'm planning to make this change SOON. Like, next weekend soon. You will already notice that I removed my roller coaster header. Hmm? Did you see? Also, I *might* have to set up a new Facebook page. I'm pretty stressed about this because building a page on Facebook has been a pretty slow process for me, so I really don't want to lose the 248 lovely likers I currently have. It's all Facebook's fault! I keep trying to "Update Page Info" but it does absolutely NOTHING, goes NOWHERE. The link is like BROKEN. Or it hates me. I was able to update the little blurb below my photo via the mobile app, but changing the name is another matter entirely. Whatever happens, will you follow me over to a new page if I have to make one? Pretty please? So come on, have a guess. What do you think my blog name will be based on this quote?